Ex Sydney 24th May 2019. 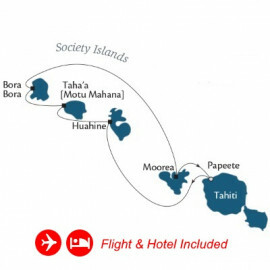 Return economy class airfare with Air Tahiti Nui from Sydney or Melbourne or Brisbane. Join the m/s Paul Gauguin, the highest-rated and longest continually sailing luxury cruise ship in the South Pacific, for a nine-night luxury Sojourn that includes return economy class airfare, two-night pre-cruise stay at the InterContinental Tahiti Resort & Spa and a luxurious seven-night Tahiti & the Society Islands cruise on The Gauguin. Ex Sydney 24th May 2019 and enjoy 2-night pre-cruise stay at the InterContinental Tahiti Resort & Spa.